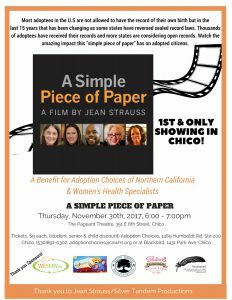 Tickets available online or at Adoption Choices/Women’s Health Specialists, Chico or Blackbird in Chico! Also listen in for an adoption show on KZFR, 90.1 FM, on Thursday, November 9th from 6:00-7:00PM. Director at Adoption Choices, Marikathryn Hendrix, will be interviewing adult adoptees about their experiences with adoption.